I would rate this higher based on the strength of the latter half or so, which is phenomenal; it's emotional and gripping with Bogart clobbering his role. That monologue and the ensuing climax is beautiful, especially, but it's all enthralling. Unfortunately the first bit of the movie is pretty standard stuff, with a love story that seems completely pointless (I know that it's trying to add depth to a character but it's unnecessary). Romance 'B' plot stunk to high heavens, but Bogart had one of his most interesting roles here as a high-strung naval captain oscillating from fragile fear to high-volumed madness. super awesome. could actually stand to be a few minutes longer, even. Dec 23, 2014 Simon M.
The penultimate scene with Humphrey Bogart (on great form) and the final one with José Ferrer are both very, very good. They're awesome actors. And Van Johnson was quite good as well. One of those films which falls short of perfection, but which nonetheless invites repeat viewings by its very solidness. 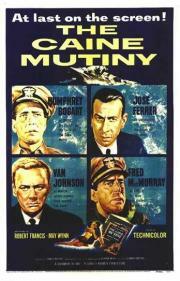 The story of THE CAINE MUTINY is a gripping one, and the excellent performances--Humphrey Bogart as Queeg, Van Johnson as Maryk, Fred MacMurray as Keefer, and Jose Ferrer as Greenwald especially--make for compelling viewing. At times, the story feels truncated (the result of studio-imposed cuts) and Edward Dmytryk's direction is a little flat, but it retains most of its power. I prefer my crazies a bit more crazy. This wasn't bad, but I didn't consider it particularly good. It has its merits and its problems. I didn't think Bogart was really that good until the court martial. Fred MacMurray stood out. I really hated the score too, like almost every moment was supposed to be some kind of happy laugh out loud moment or something. I think it needed to be more dramatic, with more conflict between the officers and Bogart. It's wonderfully shot, the actors are terrific (particularily Bogart, McMurray and Ferrer) and the score is inspired. The romance sub-plot doesn't fit well with the main plot and should have been explored further or left out entirely but the court scene and the storm scene are extremely well done.